There quite a few great snippets of information in Do More Faster. It is worth a read if you will ever find yourself in a tech startup space. I enjoyed Do More Faster. I am not usually a fan of books that are a compilation written by different authors. I tend to find then disjointed and without a well paced rhythm. But I really enjoyed the previous two books by Brad Feld so I wanted to give Do More Faster a try. Despite these challenges the book was very enjoyable, with great gems of information and advices throughout. The authors sorted the contribution according to themes to try and get more cohesion and succeeded to an extent. 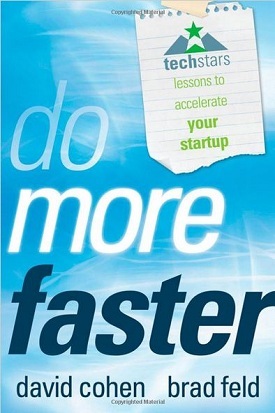 Do More Faster is co-authored by David Cohen the co-founder and CEO of TechStars. The contributors from the book also are all connected to TechStars in some way. One thing I really enjoyed was the comments David and Brad would give after most of the piece by contributing authors. This is the best articulation of this idea I have heard so far. It seams the odds are more in you favour in a multi founder startup. One of the arguments is that you need more than one person to keep the passion and enthusiasm going through some of the challenging times every startup face. This was a really cool idea. And one I would have benefitted from 10 years ago. Instead give the founders of a company their entire allocation of share right of front. You make them vest over time. For example, if you had two founders who agree to split the shares 50/50. Instead if the vesting was done over 4 years, they will get a fifth of their shares at the start and then at the end of each of the next four years. This means if one of the founders leave after year one, at the end of the five years the share split will be 50/20. This is a very important piece of paper the founders of the business needs to complete upfront when they start a company with a vesting agreement. It saves the founders a huge tax liability later. Matt Galligan who writes this piece, didn’t file his 83(b) once and paid for it dearly. There quite a few great snippets of information like this in Do More Faster. It is worth a read if you will ever find yourself in a tech startup space. I enjoyed Do More Faster. This entry was posted in Book Reviews, Reviews on 2012/12/14 by Justinus.